Get out and explore! Exciting island vacation tours offer premium quality time for families – and you’ll find plenty of fantastic options to choose from at Playa Mia. Whether you’re planning a trip with tweens or a multi-generational vacation, check out our best Cozumel tours for families that your kids are sure to love. Beach Day Pass – With 20 included attractions, spending a day of fun in the sun is always a hit with the all-ages crowd. Toddlers will love the pirate ship at Buccaneer’s Bay and bigger kids can bounce across the water on our floating challenge track. Cozumel Snorkel Tour – For older kids, tweens, and teens, a snorkeling excursion will give them something to brag about back home. 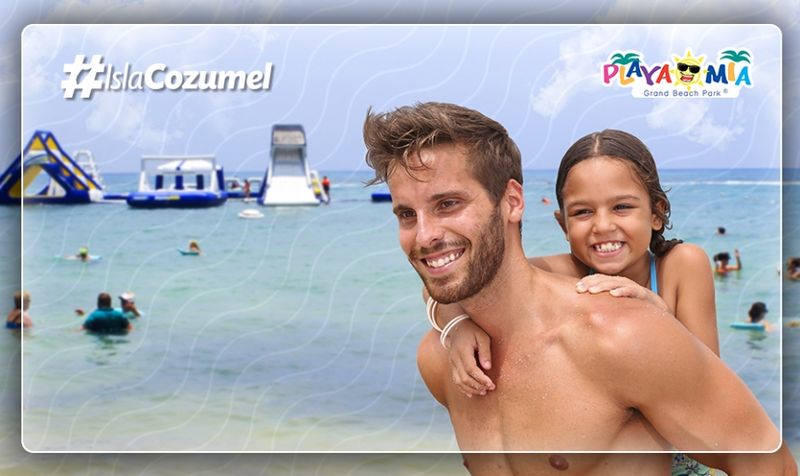 Load the whole fam onto a boat and submerge yourself in Cozumel’s magical underwater world. Segway Local Village Tour – Hop on a Segway and cruise around the island from a different perspective – on two wheels! No experience is necessary to drive one of these sweet machines on a tour of a local village. Beach Day Pass + Buffet – Please everyone at lunchtime with our extensive international buffet, which is loaded with kid-pleasing treats and Mexican specialties. Find everything you need to have the time of your lives in one place at Playa Mia Grand Beach Park. Swim at the beach, play pirates in the sand, and fly down towering water slides – and make lifetime memories in just one day. Browse our amazing attractions and plan your trip today!